Here's Callaway's answer to the Sky Caddie. 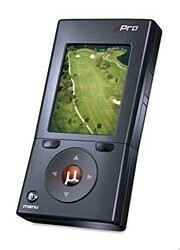 It is a fancy golf GPS that gives you exact yardages to anything you desire while you play the course. It's pretty cool, too, especially the Pro Mode which provides you with an aerial flyover of the hole just like you see on TV while watching the PGA Tour. But I'm getting ahead of myself. Chances are if you are reading this, you are trying to decide between the uPro and the Sky Caddie. These are the two market leaders in the virtual caddie world. As I mentioned previously, uPro has a Pro Mode that sets it apart from Sky Caddie with the flyover shots that give you a photo copy of the hole (kind of like Google Earth). In addition, there is no annual fee, but you do have to pay for downloading the golf courses for the Pro Mode which will run you about $10 a shot (less if you buy in bulk.) One course is included in the initial price of the device. The devise is very small and sleek, similar to a small cell phone, and it's pretty easy to set up. Battery life is not good. Don't try and take this out for 18 holes unless you've just unplugged it. It has some issues with timing out and freezing up. This is a pain in the neck to have to restart. It takes some time to calibrate when you first turn it on, thus make sure you turn it on at least five minutes before you start your round. The Pro Mode is cool, but it's also hard to see in direct sunlight. Having weighed the pros and cons, for the money you are going to be shelling out for one of these cutting edge gadgets, I'd point you towards the Sky Caddie and give Callaway a few more years to perfect the uPro. If I want a golf gps watch, I’ll buy from Garmin. And of course, if I want to buy a golf gps handle, Callaway is the first choice!